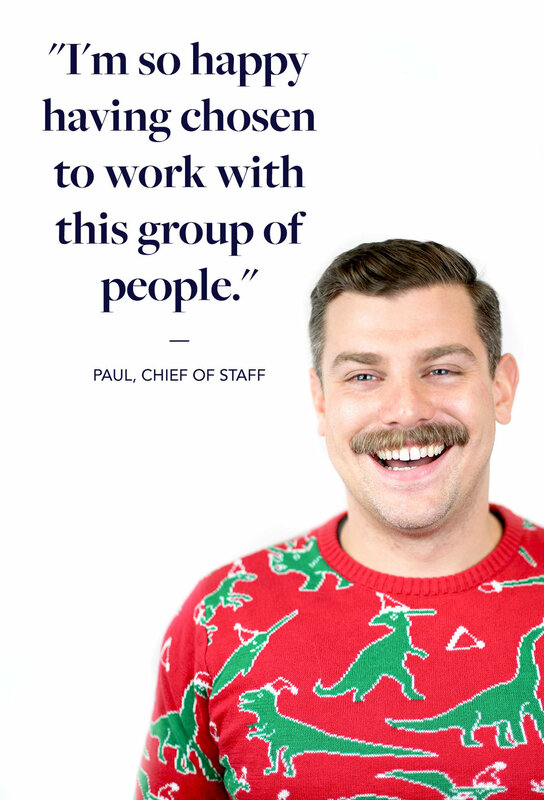 We asked our Chief of Staff, Paul, to create a playlist of his holiday faves. Get into the holiday spirit, learn a little about Paul, and consider this playlist our gift to you. What's your go-to song on the playlist and why? This playlist was so much fun to put together! It’s sequenced purposefully so that the listener will experience a little magic in each section. I loved including artists like Joni Mitchell, Ella Fitzgerald, and Patti LuPone all one playlist! Many songs include a sentiment that means a lot to me - having the ability to choose how we celebrate and live. A powerful song in the Christmas Canon , ‘Happy Xmas (War Is Over)’ includes Yoko Ono and John Lennon’s message of the ultimate expression of our individual’s choice: “War is over - if you want it." We all have a choice when it comes to our happiness, and we have a choice in how we use that happiness and ourselves to influence the world around us. I choose happiness, every day of the year. My partner and I have made a tradition of celebrating the holidays and new year together, often in far flung places. My favorite holiday memory with him was a trip to London - we rang out the old and rang in the new on top of Primrose Hill, overlooking central London, with hundreds of strangers. What’s your fave thing about working at UrbanStems? UrbanStems has an incredible culture that celebrates people and the experiences we create together. As Chief of Staff, I have opportunities every day to work across our teams, listening to ideas and stories and encouraging each person to create a bigger, better version of UrbanStems. I am so happy having chosen to work with this group of people.